The Laguna Foundation was formed in 1989 following the convening of the State of the Laguna conference, which brought together the private and public agencies and interests with a stake in the Laguna's condition and future. Incorporated in 1990 as a tax-exempt 501(c)(3) nonprofit organization, we remained an all-volunteer group until 2002. During those years we implemented small restoration projects, made comments on public policy issues that affected the Laguna, convened Laguna stakeholders to develop a Coordinated Resource Management Plan for the Laguna which identified broad, shared goals and objectives for improving its water quality, habitat value, flood retention capacity and other public benefits, and began a Laguna docent training program and wetland education program serving local elementary schools. In 2002, the Foundation's Board of Directors concluded that its mission to protect, restore, and educate the public about the Laguna ecosystem could not be advanced rapidly enough without the benefit of staff. To that end, an Executive Director and a Resource Development Director were hired. Since that time, our activities have ramped up rapidly as we've taken on big restoration and conservation science projects, expanded our education programs, and created the Laguna Environmental Center. Be sure to vheck out our Historical Timeline for an overview of our acomplishments! Provided wetland education and field trips to the Laguna to over 11,000 elementary school students through our Learning Laguna Program. 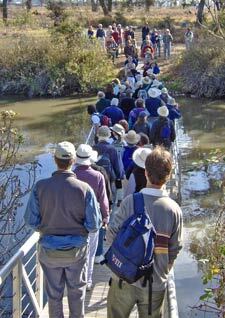 Taken many hundreds of adults on outings into the Laguna, introducing them to the Laguna and its vibrant ecosystems. Completed restoration projects to reestablish wildlife habitat by planting over 50,000 native trees on over 200 acres. Convened two more State of the Laguna Conference and Science Symposiums, bringing together scientists, land owners and managers, public agencies, business and community members for the purpose of sharing our science and creating dialog. Developed the Laguna Environmental Center which includes: a renovated farm house that is now our administrative offices, Great Blue Heron Hall, an Outdoor Learning Center, and a native plant nursery.